Approved mixed-use development project totaling approximately 500,000 square feet. The Parcel K project will include a 12-story residential building containing 304 rental apartment residences and a 12-story Hyatt Place hotel with 294 rooms. The apartment building will feature a rooftop pool, clubroom, and terrace, and the hotel building will feature a rooftop fitness room and pool. The buildings will also contain approximately 12,000 square feet of office space and approximately 18,000 square feet of retail and restaurant space. A one-level underground parking garage will have the capacity for approximately 450 cars. The building boom in Boston's Seaport continues as site work is not underway at Parcel K, at the corner of Northern Avenue & Congress Street. The upcoming project feature 2 buildings, a 304 unit residential building and a 293 room Hyatt Place Hotel. There will also be 12,000 sf flex/innovation space and 18,000 sf of retail on site. Massport has approved a long-term ground lease for the 2.5-acre Parcel K in the Seaport District, allowing a 500,000-square-foot mixed-use development to proceed with construction next month. 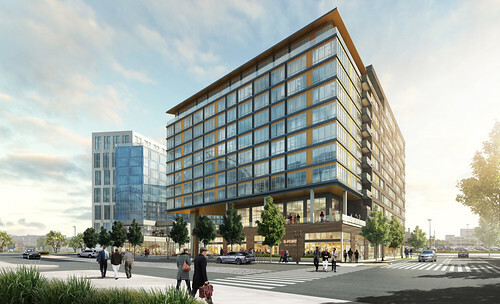 The development, developed by Lincoln Property Company and Phoenix Property Company, will feature 304 residential apartments, a 294-room Hyatt Place boutique hotel, approximately 12,000 square feet of office space and approximately 18,000 square feet of retail and restaurant space across two new-construction 12-story buildings. Construction is now expected to commence in December and last approximately two years. Parcel K is owned by Massport and located at 315 Northern Avenue in the Seaport District. Minor changes to the approved Parcel K development in the Seaport District were approved at Thursday (December 15th)’s Boston Planning & Development Agency (BPDA) Board Meeting. The revised project will move forward with 304 residential apartments, a 293-room boutique hotel, approximately 14,400 square feet of office space and approximately 18,000 square feet of retail and restaurant space. New rooftop amenities have also been added, including a small fitness room and pool at the hotel building and a pool, a clubroom and an outdoor roof deck at the residential building. On-site parking capacity will also be reduced slightly, to 420 from previously approved 640. Phoenix Property Company (PPC) and Lincoln Property Company (LPC), who are taking over the Parcel K project from Conroy Development, anticipate to start construction of the Parcel K project in March 2017, with completion anticipated in July 2019. Per a Notice of Project Change (NPC) submitted to the Boston Planning & Development Agency (BPDA) last Thursday (September 29th, 2016), Phoenix Property Company (PPC) will partner with Lincoln Property Company (LPC) to develop Parcel K in the Seaport District; the following is a link to the NPC. It was announced earlier this month that LPC would take over the Parcel K project from Conroy Development, who was designated by Massport, the site's owner, as Parcel K's developer in 2009. LPC and PPC anticipate to start construction of the Parcel K project in March 2017, with completion anticipated in July 2019. LPC and PPC propose minor changes to the Parcel K project plan approved by the BPDA in 2009. The revised project would feature 304 residential apartments a 293-room boutique hotel, approximately 14,400 square feet of office space and approximately 18,000 square feet of retail and restaurant. As previously approved, two buildings, one with a hotel and one with residential units, would be constructed at Parcel K.
Proposed hotel rooms have increased by 46, from 247 rooms to 293 rooms; the number of proposed residential units has not changed. Interior layouts of both proposed buildings have been modified to enable occupancy of the 12th floor; the 12th floor was previously proposed to contain mechanical space. As a result of the interior layout modification, the hotel's 12th floor would now feature a small fitness room and pool, and the residential building's 12th floor will now feature a pool, a clubroom and an outdoor roof deck. The previously approved building massing has not been altered with the proposed 12th floor modifications; total building square feet would increase by approximately 19,397 square feet to 499,500 square feet from previously approved 479,678 square feet. Parcel K’s underground parking garage would be reduced to one level and a maximum of 420 spaces from three levels and 640 spaces; 197 spaces would initially be striped. Banker & Tradesman reports that Lincoln Property Company of Boston will take over the approved Parcel K development project in the Seaport District and hopes to break ground in early 2017. Lincoln Property Company Executive Vice President John Miller confirmed the news; Lincoln Property Company will self-manage the property. Conroy Development of Stoughton, MA was designated by Massport, the site's owner, as Parcel K's developer in 2009; Conroy Development's project plan received approval from the Boston Redevelopment Authority (BRA) in May 2014. The approved Parcel K plan will construct an 11-story residential building containing 304 rental apartments and a 10-story hotel building containing 250 rooms. Approximately 16,000 square feet of innovative office space and 25,000 square feet of retail will be located at the project's ground floor. At last night’s Fort Point Neighborhood Association meeting, the Massachusetts Port Authority (Massport) gave an update on Parcel K, an approximately 500,000 square foot mixed-use project approved for construction on Massport's Parcel K in the Seaport District. The project is in its final design stage; expected completion of design work is in the third quarter (Q3) of 2016. The Parcel K project is expected to break ground in the fourth quarter (Q4) of 2016. Construction of the project will take just over two years, with expected completion in the first quarter (Q1) of 2019. The Parcel K project's developer is Conroy Development Corporation, who has entered a long-term lease with Massport to develop the parcel. More information about the Parcel K project is posted below.